DALLAS – The Vancouver Canucks (29-32-10) open a quick two-game road trip this evening against the Dallas Stars (37-29-5) at American Airlines Center. The team will move on to Chicago to face the Blackhawks tomorrow. Dallas is the only city the Canucks have not yet visited this season. 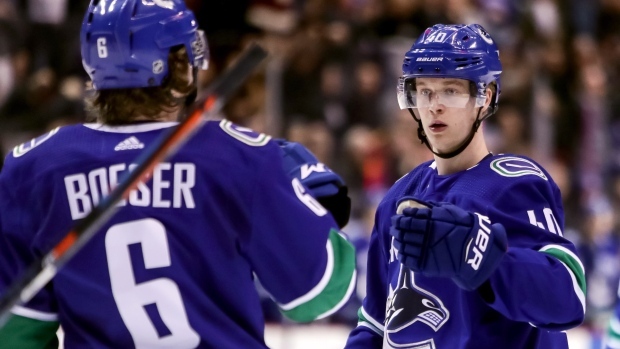 The Canucks are coming off a 3-2 shootout loss at home to New Jersey on Friday night. Elias Pettersson opened the scoring on a second period power play and Tanner Pearson staked the Canucks to a 2-0 lead early in the third, only to see the Devils respond with a pair of goals of their own. New Jersey won the game in the seventh round of the skill competition. Friday was the second straight game the Canucks had jumped out to a 2-0 lead – only the second time all season that has happened. The others were against Nashville on December 6th and repeated in St. Louis on December 9th. After struggling mightily with the man-advantage for much of the season, the Canucks have scored power play goals in consecutive games for the first time since late November. Pettersson’s goal against the Devils was his first in 12 games and was his team-leading 27th of the season and team-high ninth with the man-advantage. His goal gives him 59 points on the season which ties Trevor Linden for the second-highest rookie point total in franchise history. Pettersson’s next point will match the 60-point seasons Ivan Hlinka and Pavel Bure posted in their first years in the league. For the second straight game, the Canucks lost a player for the remainder of the season. Chris Tanev left Friday’s contest early in the first period after blocking a Kyle Palmieri shot on a New Jersey power play. Tanev suffered a broken foot and will miss the final 11 games of the season. The injury occurred just four periods into Tanev’s return after missing 11 games with an ankle injury suffered in mid-February. He also missed time early in the season with a hip issue. In all, Tanev was limited to just 55 games this season. On Wednesday, former Stars forward Antoine Roussel suffered a knee injury. With Tanev out, Luke Schenn draws back into the line-up and will be paired with Ashton Sautner. Jay Beagle, who missed Friday’s game due to illness, is expected to return tonight. Nikolay Goldobin will likely be a healthy scratch up front. The young Russian has gone eight games without a goal, has one in his last 17 and just two in his past 31 games. Jacob Markstrom stopped 31 of 33 New Jersey shots and five of the Devils shootout attempts. He has limited opponents to two goals (or fewer) in 20 of his last 34 starts. Markstrom will get the nod again tonight. Bo Horvat set up both Canucks goals on Friday and now has a goal and three assists on a three-game streak. Brock Boeser collected an assist on Pettersson’s goal to extend his point streak to five games (two goals and four assists). Despite solid production from Pettersson, Boeser and Horvat, the Canucks are the lowest-scoring team in the NHL since Christmas with 74 goals in 32 games. Tonight, they face the second-best defensive team in the league this season. Only the New York Islanders (166) have allowed fewer goals than Dallas (175). The Stars are also the stingiest team on home ice this season surrendering just 80 goals in 35 games. On the other hand, the Stars are 29th in the league in offence averaging 2.52 goals per game this season. The Stars are coming off a 2-1 loss at home to Vegas on Friday. Rookie Roope Hintz scored for a third straight game. He has four goals in those games. The Stars are in the thick of the Western Conference playoff chase. They head into action holding down the first Wild Card spot, two points back of St. Louis for third in the Central Division, one point up on Arizona and three in front of Minnesota. Under first year head coach Jim Montgomery, the Stars are 6-2 in their last eight games and have given up just six goals in their last seven outings. Anton Khodobin made 35 saves on Friday and will get a second straight start while Ben Bishop recovers from a lower body injury. Tyler Seguin leads the Stars in goals (27), assists (38) and points (65) while captain Jamie Benn leads the team with eight power play goals. Stars defenseman Taylor Fedun played one game for the Canucks in the 2015-16 season. He picked up the primary assist on a Bo Horvat goal in Carolina on January 15, 2016. Although Dallas has an impressive 21-12-2 on home ice this season, the Stars have dropped back to back 2-1 decisions to Vegas and Chicago. The Canucks won both of their visits to the Lone Star State last season posting 6-0 and 4-1 victories. Jacob Markstrom was in goal for both of those games. The Stars took the only meeting of this season so far beating the Canucks 2-1 in Vancouver on December 1. After Bo Horvat opened the scoring, Jamie Benn tied the game midway through the third period and Alex Radulov scored the winner with 3:23 remaining.